Description: Trains pass the photographer every seven or eight minutes at Curtis Hill. I found an oil lease road that had an open gate to get to the curve just east of Belva. Description: Just east of the Hwy 10 overpass. We witness 5446 making good time. Crew must want some excellent BBQ. Description: there was a lot of power staged in the yard on a clear February day - one Cascade green BN was a nice find. 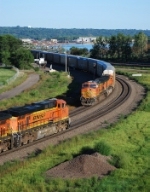 Description: BNSF light power rolls East as a manifest train waits at CN Crossing to head over the Mississippi River.